NEWTOWN, Conn. [July 12, 2017] – The world's insatiable demand for global communications is pushing commercial communications satellite manufacturers to create more innovative designs, and in considerable quantities. According to Forecast International's Platinum Forecast System®, 844 satellites worth an estimated $83.5 billion will be produced during the 2017-2031 period. This year alone, satellite builders will deliver some 84 units, a peak in the 15-year production cycle driven primarily by production of the Iridium NEXT mobile satellite communications by Thales Alenia Space. 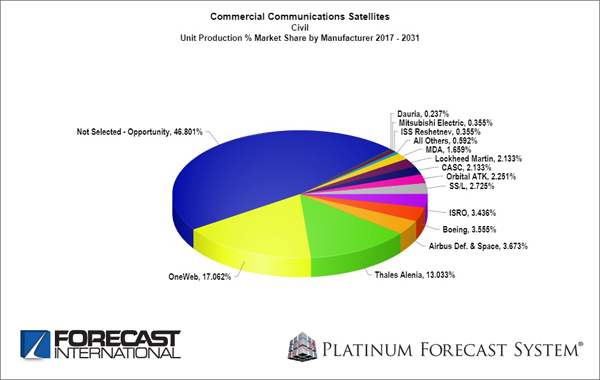 Leading the market for commercial communications satellites in terms of value over the next 15 years will be Boeing, Thales Alenia, MacDonald, Dettwiler and Associates (MDA – which purchased Space Systems / Loral), Airbus Defence and Space, and Lockheed Martin. In terms of production, OneWeb will lead the field, producing a conservative estimate of 144 units during the 15-year period. The company, which this spring broke ground on an $85 million high-volume satellite manufacturing factory in Exploration Park, Florida, is planning to girdle the globe with a constellation of 648 small, low-Earth-orbiting satellites to provide worldwide Internet access, particularly in rural areas. Even as demand grows in the developing world, satellite manufacturing remains dominated by developed countries. Specifically, the U.S. and countries in Western Europe accounted for 81.5 percent of satellite production between 2012 and 2016. Forecast International space systems analyst William Ostrove noted that Russia, India, and China are also important satellite production centers. "However," Ostrove said, "these countries do not compete heavily in the commercial communications market. Instead, their satellite industries are more focused on the government market. Nonetheless, they still have a presence in the communications arena." Elsewhere, Japan, Israel, and Argentina are also developing satellite manufacturing capabilities. The competitive environment will continue to provide challenges and opportunities to satellite manufacturers. U.S.-built satellites have been shifted from the U.S. Munitions List (which requires a Department of Defense review of exports) to the Commerce Control List (which is managed by the more export-friendly Commerce Department). This move should improve the place of U.S. satellites in the overall market. Export credit agencies, which provide government-backed loans or loan insurance, have driven the export of satellites by manufacturers in the U.S., France, and China. Forecast International, Inc. is a leading provider of Market Intelligence and Analysis in the areas of aerospace, defense, power systems and military electronics. Based in Newtown, Conn., USA, the company specializes in long-range industry forecasts and market assessments used by strategic planners, marketing professionals, military organizations, and governments worldwide. Forecast International also maintains a high posture of situational awareness and geopolitical analysis. Forecast International's resources and extensive base of experience can also be readily adapted and efficiently focused to fulfill a broad spectrum of civil and military consulting and special research requirements. The company is increasingly performing proprietary consulting studies in support of the diverse markets it covers.